ITV has released a few teaser previews of the upcoming I’m A Celebrity trailer, which features presenters Ant and Dec down-under and lost in the jungle. Everyone is waiting with bated breath to hear which celebrity contestants will be entering the Australian wilderness this year’s series of I’m A Celebrity: Get Me Out Of Here. In the meantime, however, the show has given fans a little taste of what is to come after releasing a few images and sneaky snippets of the I’m A Celeb trailer, which debuts in full on Saturday 22nd October. 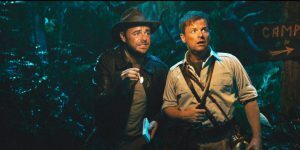 The first-look images display a lost and terrified Ant and Dec, as the two Geordie presenters explore a dark and creepy jungle. With fedoras and torches on show, the hosts are given an Indiana Jones-style makeover in this hilarious new trailer. And it’s not long until the celebrities will be joining the duo on their gruelling jungle adventure. Among the many rumoured celebs who might be appearing on the show are former Countdown presenter Carol Vorderman, controversial boxing champion Tyson Fury, TOWIE star Kate Wright and Strictly Come Dancing‘s Aliona Vilania and Ola Jordan. And that’s just to name a few. Click here to read the full list of potential jungle contestants this year. Prepare yourself for your next fix of bug-eating Bushtucker trials, because we haven’t got long to go now! I’m A Celebrity: Get Me Out Of Here returns next month on ITV.